Ever wished you could take your reloading press to the range for load development using a hassel free setup? Or how about take it to the cabin, so you could while away the evening hours reloading while enjoying indoor comfort? Or how about on that business trip where you have to drive, and have nothing to do in those evening hours? The solution is to make your reloading press portable. Read on and learn how to convert a common piece of hardware that may already be in your garage into a strong, portable base for your reloading press. Get a set of extra bolts, nuts and washers for your press. I like to use a spring washer under the bolt head, then a flat washer followed by a wing nut under the bench. Easy to tighten and easy to loosen, and they stay tight while using the press. Retrieve you existing Black & Decker Workmate or similar designed portable workbench from the dark reaches of your garage or workshop, or buy a new one, or pick one up used from Craig's List or from a local garage sale. One important feature of the Workmate for our purposes is that they fold up into very compact and portable benches. The models you need to use are those with the four flip-out legs - Models 200, 225 and 425. The reason for this is that the press can be mounted in such a way as to be back of the centerline of the frame, and can therefore take more leverage force from the press compared to the X-frame model, where the press would be mounted more or less on the centerline of the frame. If you have an X-frame, by all means try it out and see if it meets your needs, before getting a Model 200, 225 or 425. I used my 25 year old Workmate 200. It has been a reliable helper over the years and since I no longer own a house, it had languished for a few years in my ex's garage. I was delighted to put it to a new use, especially in support of reloading, something I am relatively new at, and very excited to be involved in. Open up the Workmate and set it up as though you were going to work with it as normal. Position the press on the edge of the workbench that is the furthest away from a set of legs and just barely to the left of the right jaw handle, enough so the press arm clears it. Using a pencil, mark the center of the press bolt holes on the top surface of the Workmate. Choose a Drill Bit - Choose a sharp drill bit that is a little wider than the bolt shaft so the bolt will slip in the hole. Hold up the drill bit behind the bolt to make sure you can see just a little of the drill edges either side of the bolt shaft. Drill the holes slowly and carefully, no need for speed here. Rock the drill around a bit while drilling to open up a slightly bigger hole than the actual bit size. This will give you a little wiggle room when inserting the bolts later on. I used a 5/16" drill bit for my Lee Breechlock reloading press. Place the press on the Workmate over the holes and insert the bolts, placing a spring washer under each bolt head. Fit the flat washers from underneath and spin on the wing nuts and tighten. 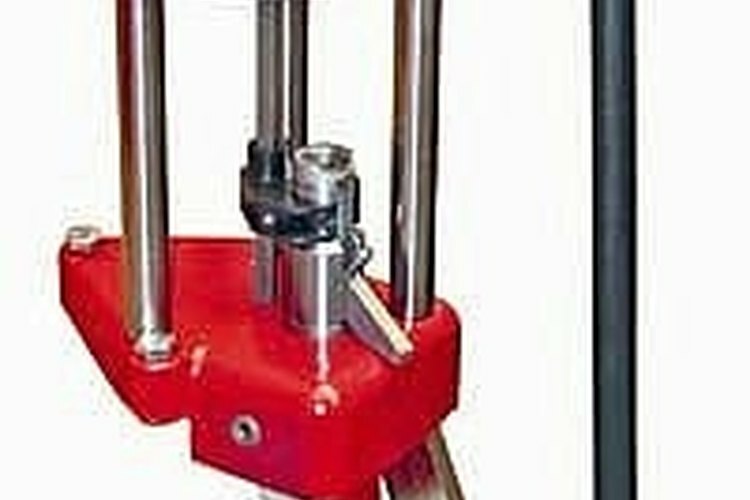 Now you have a portable base for your reloading press. You could attach a work surface fashioned like a three-sided box to put all your reloading materials in as well. Enjoy. After I wrote this article I did a search and found that accurateshooter.com published an article in 2008 about using a B&D Workmate as the basis of a portable reloading bench. Their solution is quite different and you have to give over your Workmate to reloading permanently, as they strip the cranks and attach a permanent plywood or oak top box to the bench. I am sure a temporary box could be adapted to my design that will still leave you the flexibility to use the Workmate for what it was originally designed for. The choice is yours. Total project time when you have all the pieces available - 10 minutes. You may need to weigh down the Workmate with a shot bag or sand bag, because the up stroke of a full-length resize may lift the bench off the ground. If you are just neck resizing then there will be no issue.